The recent Maximum Velocity Track & Field Academy at Centre College gave current Centre track team members, and alumni, a chance to work with Olympians like world record holders Aries Merritt and Kevin Young as well as Lauryn Williams, one of only five people ever to win medals in both the Winter and Summer Olympics. Centre coach Lisa Owens, the camp director, also had other Olympians who had won gold medals to work with youngsters at the three-day camp that attracted participants from various states and gave the Centre athletes a chance both to coach and learn. Freshmen Calvin Steber of Danville and Connor Rohrbaugh of Knoxville along with junior Emily Akin of Cincinnati and former Colonel Emily Niehaus shared their perspective on the camp. Question: Why did you want to work the track camp? Emily Akin: "I wanted to work Maximum Velocity again because it has become such a highlight of my summer. I have attended the camp as either a participant or counselor since its very first summer and it has been such a pleasure to watch it grow into one of the premiere camps in the nation. I have watched the same campers return every year and bring new friends with them. MVTFA has one of the greatest senses of family that you will find at any athletic camp." Calvin Steber: "I was free for that part of the summer and Coach (Lisa Owens) needed counselors." camp embodies what I love/loved most about my alma mater, Centre College: personal education & extraordinary success. MVTFA connects impressionable youth to elite-level athletes in an intimate and earnest manner. The 12-18 year olds see first-hand that track and field national champions, Olympians, Olympic-gold medalists, and world-record holders are real people. They catch a glimpse of all the diligence and ups and downs that these elite athletes experience/d and, hopefully, realize that being an Olympian and/or pro-athlete isn't just genetics. It's in combination with tons and tons of passion and hard work. Additionally, the kids see that track and field provided an avenue for all of them to earn a solid education at a reduced cost. "Furthermore, and just as important, these young students are connected with NCAA Division III athletes (us, the camp counselors). We compete and work with diligence to represent Centre College via athletics without being paid a single dime. We will likely never set foot at USATF nationals nor the Olympic stage. Yet there we are at a camp spending our time daily from 7 a.m. to 11 p.m. striving to show these students how amazing track and field is. For the 99.9 percent of the kids that won't make it to the Olympics, us Division III athletes show the junior high and high school students another capacity that a person can love the greatest sport on planet earth (track and field). We act as mentors and liaisons for these youth to explore how track and field could fit into their future, even if their genetics don't allow for them to sign a full-ride scholarship to a top track program in the nation." Connor Rohrbaugh: "I wanted to work this camp because I love working and coaching with athletes! I have coached my 10-year-old little brother in all of his sports for many years and I love coaching as well as learning and this seemed like a great opportunity." Question: What stood out to you the most about the Olympians who worked as clinicians? Akin: "I say this every summer, but I think what impresses me most about the clinicians is their passion and humbleness. They are so willing to share every once of knowledge they have about their sport and are genuinely impressed with the next generation of athletes they work with." Steber: "In the individual training groups the Olympians were able to make a bond with there kids and really give them useful advice that I wish I had known when starting out with my training." Niehaus: "What stuck out the most to me about the Olympians/clinicians is that each of their respective journeys to the Olympics/elite-level was as different as all the 20 plus track and field events. None of their journeys were easy or simple. All had seasons and seasons and years and years of disappointments, yet stuck it out to become the successes they are." Rohrbaugh: "The one thing that stood out to me with the Olympians is how much fun they had teaching and how approachable they were. They were very helpful and very patient with everyone." Question: Which Olympic athlete impressed you the most and why? Akin: "This summer I was really impressed by Lauryn Williams. She is small but mighty and brought not only a great passion for the sport and fantastic instruction in the sprint events, but a new perspective on the athletic journey since she has experience as both a summer and winter Olympian. I also enjoyed working closely with Hazel, who recognized that though not everyone can become an Olympian, we can all strive to be the best in whatever we pursue." Steber: "I think Lauryn Williams impressed me the most with her support of her athletes and ability to know almost all the kids by name. She also was the most humble of the Olympians from what I saw at the camp." Niehaus: "Stephanie Brown-Trafton impressed me the most of all the clinicians. She has managed to balance a real-life career, marriage, and motherhood all while earning an American record and Olympic gold medal. As a Centre College 2012 graduate with many of my friend starting careers and/or families, I can't imagine how Stephanie managed this level of dedication to the discus and her family. This is all in spite of the tough cards she was dealt as a young girl, including the death of her mother." Rohrbaugh: "Well I may be partial because it was the group I worked with but, I feel that Stephanie Brown-Trafton did an incredible job! She worked with kids who had been throwing their whole lives and some who hadn't ever thrown once before and was able to help improve all skill levels. Also, she threw some with us and was very down to earth." Question: What do you think you got from the camp experience? Akin: "I think I took away a renewed vigor for summer training as I prepare for my final cross country and track seasons as a college athlete. The camp is such an illustration of the power of hard work and dedication. 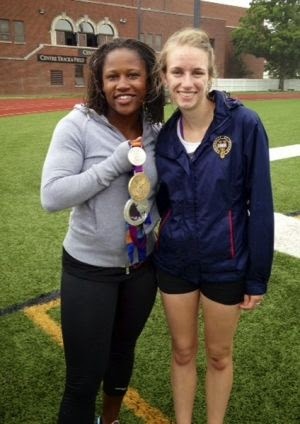 I will never forget wearing Lauryn's gold medal- that was the highlight of my summer for sure." 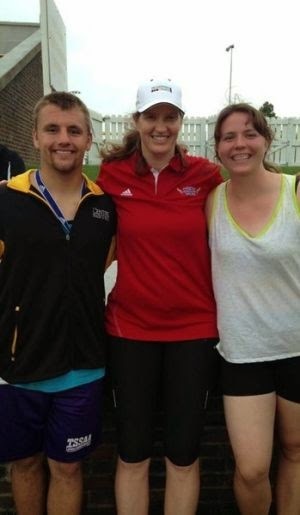 Steber: "I gained a better knowledge of many different aspects of track and made some friends while doing it." Niehaus: "I was blessed for this to be my third year working with the MVTFA camp. Every year I walk away from MVTFA with more and more friends and solid memories. I even stay in touch with some of the campers throughout their following tf seasons and love seeing the kids taking what they learned from the camp and applying in their own lives. The campers tire out us counselors, but provide an endless amount of energy and hilarity! "Every year I have learned something from the clinicians that I then take back to the students that I personally coach. I know that I will continue to use the knowledge/perspectives that I learn every year at the MVTFA for years to come as I coach after pharmacy school. "Additionally, the clinicians, especially the older ones, provide a glimpse into track and field history and where its headed in the future: Rose Monday discussing her and NCAA Division III phenome Edwin Moses drafting the first anti-doping policy that the USA track and field governing body accepted or Francie Larrieu Smith describing her first Olympic experience at the age of 19 at a time when even California did not have girls on their high school track teams." Rohrbaugh: "I feel like I learned how I should really train my body as an athlete and how important drill work really is and I also learned how hard it can be to be patient with the ones you are coaching so I should be a little more sympathetic to my coaches as well."